I had the honor of playing two games against a stalwart opponent. His name was Slight Soluble. When I said hi to him at the start of the second game he responded with “Oh no, not that Lulu.” What a great start to the game! We didn’t have a jungler, because Katarina refused to play anywhere but mid, despite the fact that our team already had Lux to play mid. When Galio didn’t connect at the start of the game we immediately knew that we needed to band together to win this 4v5. Our team split up the lanes and started discussing when we would clear the jungle and how we would handle lanes. Eventually, Galio did connect, but the enemy team immediately started picking on him. It’s easy to kick a player when they’re down, isn’t it? We did really well in bot lane. Ashe wasn’t using Volley very early in the laning phase, so I could get about as much free harass on her as I wanted. Steve did a superb job or ice-balling Ashe and letting me farm in safety. We pressed our advantage to propel me to a quick lead, which got me a finished Infinity Edge and Phantom Dancer by 21 minutes, a new personal best. Katarina started complaining about lag issues. We were split. The enemy team would rather chase Nunu and myself around than pressure turrets. So I told my team that we needed to group. We started walking down mid lane and found a Skarner just hanging out by himself. As we were killing him the rest of the enemy team engaged on us. Nunu and Galio both got to channel their ults in a bush and Kog got to right-click on people who couldn’t right-click back. Those fireworks never felt better. Pet peeve: I hate buying Guardian Angel only to die a minute later. That didn’t happen this game, but it happened early this week and it just made me so frustrated. I rage-sold a Guardian Angel! I technically didn’t die, because it saved my life, but it was still taking up a slot in my inventory and had five minutes before it would be any use to me. To Smurf – to play on an account below one’s level to purposefully annihilate other player’s hopes of winning. I don’t smurf very often. That is probably apparent based on the number of games played and the account creation date. However, lately my cousin has been trying to learn how to play League and so I’ve been playing some games with him so that we both have a good time. It’s fun to play with people you know! I think it always tickles people’s brains at low level when I tell them I’m going mid, especially with picks like Kog and Xin. The main problem is I can beat people at this level 1v1, but don’t want to have to rely on a jungler or a support player. This game really paid off for having that mindset because our jungler was Shaco, and the worst. He was probably level five when he tried to invade the enemy team’s red buff. However, Ryze and Nocturne showed up to make his life miserable. He blinked into the Baron pit, but Ryze and Nocturne matched his blink with Flash and he wrote in all-chat “nice Flash!” Then they killed him, to which he replied “bai!” and R-R-R-R-R-R-R-RAGE QUIT! Morde had already been running his mouth. It would be worth it to paste the chat log into this blog, and that might happen eventually (*shakes head*), but for now we’ll have to be content with paraphrasing. Morde is telling us how the game is over, how he’s smart because he knows Shaco is only good as a split-pusher and as an early-game ganker, and this Shaco did neither. Morde is telling us that it’s been “gg” since the beginning. He probably knew this, but this kind of behavior infuriated me. I was having a decent game, I could push Morde right out of mid lane with about half my mana pool and then let it recharge while I pushed his lane into his tower. I was ahead in CS. Of everyone. I was getting my items. I was farming multiple lanes, and trying my best not to get caught. I was bot lane with Sona and I told her that with the items I had the two of us could fight the whole other team, except for Morde. I told her that we would stand and fight anyone we saw, except for Morde. She said OK. I had seen Morde top as I had started to push this lane, I figured we would be OK. 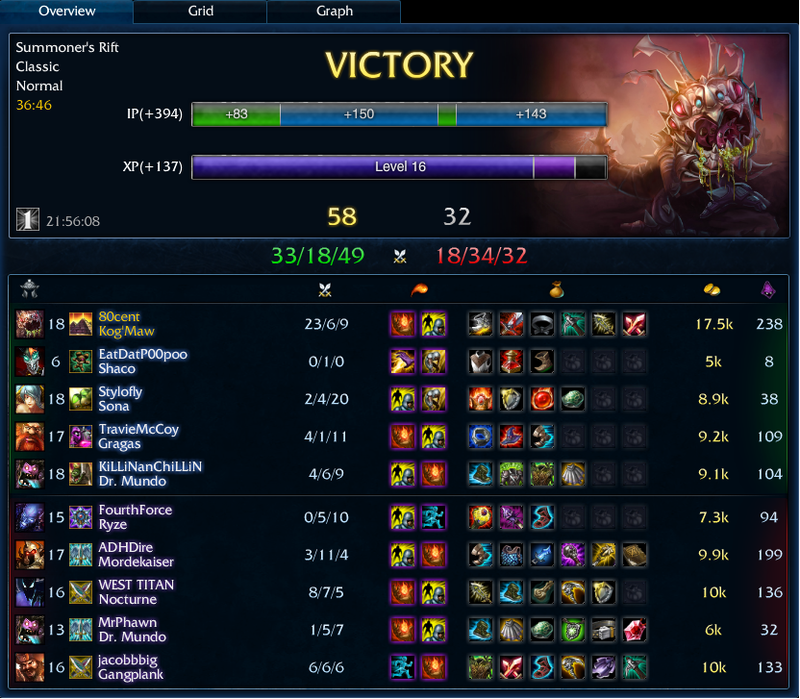 I felt even better about that when I saw four members of the enemy team standing bottom to defend the bot turret. OK, game time. Then Morde came walking out behind us. Sigh. 2v5? Ya, probably not going to happen. I melted in an instant. Sona followed shortly after. Sona starts laughing and I try to keep her optimistic. Our Gragas was oddly silent, so I knew that if we lost Sona we wouldn’t have a chance. However, I have the money for Infinity Edge, so now the game is real. The enemy team must have realized that they had a man advantage and they started pressing it. They pressured bot lane right to our second turret. I tried to tell our Mundo and Gragas to wave-clear so that the enemy couldn’t siege the turret. We could stall them out, just give us time. Then the enemy team stepped up towards double golems. Morde split from the team to walk towards red buff. I activated W and killed him in three shots and turned on his team. Dropping an ult into the bush near doubles gave me vision of everyone. A nasty fight broke out. 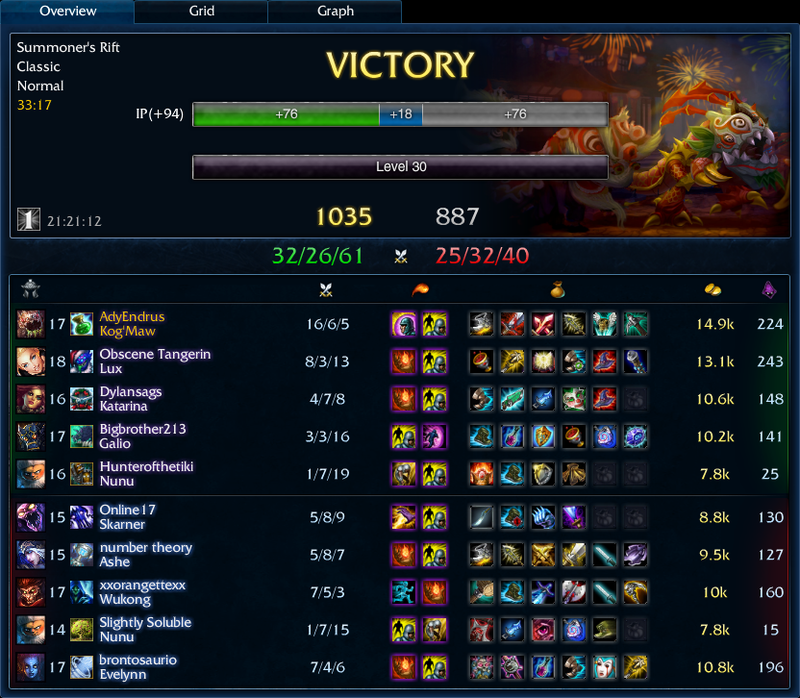 I cleaned up Ryze for a quick Double, Gangplank for the Triple, and Mundo for the Quadra kill. Nocturne was the only one left. With just a couple hundred points of life left he popped his ultimate so I lost vision of him. I had to wait for my ult to drop off the mana cooldown. By the time it came back up I had closed most of the gap on Nocturne. I walked up and auto’d him twice for the Ace and unofficial Pentakill. What a jerk move to pop his ult defensively after a team fight just to make me miss out on my penta! Now I started retaliating to Morde. I called him out for being out of position and losing his team that fight. He didn’t respond, but his team did with cheers of “report Morde” which was like music to my ears. But this game wasn’t over. We had won the battle, but we hadn’t won the war. Baron was next. We knew we had to get it before the other team did. I picked up my Bloodthirster and ran for the big purple wurm. On my way there I found a Mundo trying to attack my poor, defenseless creeps, so I killed him. With Mundo down I knew we had our best shot at taking Baron evenly. Before we had a chance to clear wards Gragas starting head-butting Baron. I jumped in and started DPSing as best I could, but then darkness fell. I knew he would come for me, so I stepped into the back of the pit in case I needed to Flash the wall. He hopped onto me, but showed up alone. I dropped Nocturne before he had a chance to react. Then Morde came around the corner. He popped ult on me, which I quickly removed with my Quicksilver Sash. Without that percentage damage on me he dropped almost as quickly as Nocturne. Then we finished off Baron. With Baron buff and three of the enemy team dead we were able to take a middle inhibitor. We wisely retreated after pressuring their base so that we could clear out their jungle, spend some hard-earned cash, and prepare for wrecking Morde’s day. The final team fight never happened. They ran into Kog with red buff one at a time and didn’t get a chance to group. I can’t remember if they surrendered or if we took their base, because I was ecstatic over beating a terrible person on a smurf account. As lame as that sounds, the feeling of winning a 4v5 after your jungler abandoned you and the enemy team talked smack was very satisfying. I had to take a break from playing League for awhile after this game because it just pushed my stress levels to a new high. It felt like so much was riding on winning this game and showing Morde that he doesn’t know when a game is over and it was foolish of him to talk smack in a game so young. Here’s to the players with more kills than the enemy team! I salute you!